Established in 1971 by Giovanni Sartori, Italian Political Science Review is acknowledged as the flagship publication of the Italian political science community, contributing greatly to its growth and development. 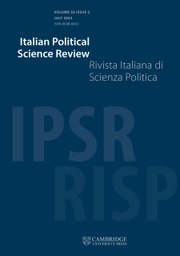 Over four decades on from its launch, IPSR/RISP continues to publish high quality and original peer reviewed research by leading political scientists and the best young scholars, from Italy and around the world. IPSR/RISP embraces all approaches to political science research, without restriction to any particular theory, method or topic. Whether theoretical or empirical, articles should seek to engage with current debates and disciplinary developments. Contributions are welcome from all subfields, including Italian politics, European politics, comparative politics, political behaviour, political theory, political economy, political methodology, public administration, public policy and international relations. Publishing three fully English-language issues per year, IPSR/RISP employs a strict double-blind peer-review process. Raising the flag among the ruins: the crisis as helping hand for opposition parties?